CPC bowsers taking back the gasoline from the derailed train. Picture by Kanchana Ariyadasa. Three elephants died on the spot after being knocked down by a fuel train at Puwakpitiya Palugaswewa in Habarana in the wee hours of September 18. 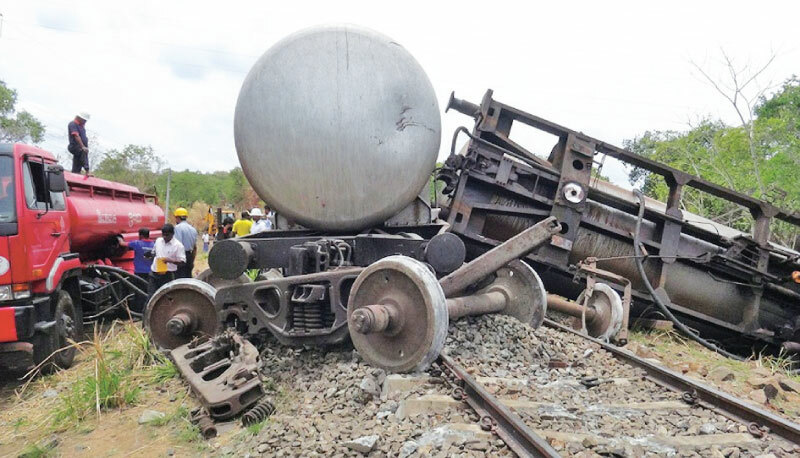 A railway employee said the fuel train involved was the Batticaloa bound train from Colombo. Among the three elephants was a pregnant she elephant and her baby too had died after getting jettisoned from its mother’s womb due to the impact.Fuel had leaked from the train when it derailed due to the impact. People in the neighbourhood had rushed to the scene with cans and buckets to collect the overflowing fuel for nearly an hour. Habarana police arrived and cleared people from the scene. Police summoned the Dambulla and Polonnaruwa fire brigades as well. A Railway spokesman said accidents involving elephants were common on the stretch between Habarana and Paluagaswewa and engine drivers had been made aware of the possible danger to minimise accidents of this nature.